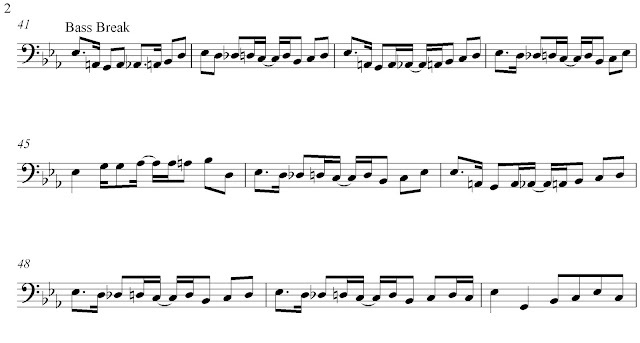 Just a quick analysis today… I stumbled across this song last week and set about transcribing it straight away. It’s a fairly unknown album track from Gaye’s 1968 album ‘Heard It Through The Grapevine’, but it has the most fantastic vocals and bass breakdown showcasing some stellar bass chops from Jamerson. It’s a great example of his signature open string bounce technique, and for that reason (as well as just being really cool) it is worth a closer look. This bass break is essentially constructed from two Eb major phrases; one bouncing from an open A string and ascending through scale tones, another from an open D and descending down through scale tones. In the first bar we can see Jamersonhitting an Eb, before using the open A to bounce down to the major third, G. From another open A we bounce up to the Ab, the fourth, before climbing up to the fifth (Bb) and seventh (D) via another open A. This whole phrase is basically an ascending phrase from the third to the seventh, tied together with lots of open A string bounces between the notes. The second bar sees a very similar approach, but instead here we begin on the Eb and descend downwards using the open D to a flattened seventh (Db), before using another open D to bounce down to the sixth (C ) and the fifth (Bb). In the last beat of the bar Jamerson heads back up to a C and D, ready for the Eb in the next bar. This pattern continues with bar three being a very similar ascending phrase to bar one, using the same open A string bounce, and bar four being almost identical to bar two, and so on. One of the only real breaks from this open string bounce comes in the fifth bar, where Jamerson plays a simple ascending phrase beginning on the root, before asking up through the third, fourth, and an A natural chromatic passing note up to the fifth. Beat four of this bar is played as two eighth notes, which is a rhythmic feel that is present throughout this section. Jamerson establishes a strong rhythmic feel within the first couple of bars that he pretty much sticks to throughout this section. On the first beat he will either play two quavers, or a dotted quaver followed by a semiquaver. Beat two is almost always a quaver followed by two semiquavers, with the final semiquaver being tied to the first semiquaver of beat three (creating a quaver), before playing another semiquaver followed by a quaver. This creates that syncopated bounce that gives this section its groove. As previously mentioned, beat four is almost always just two quavers, although in the second to last bar we see a quaver followed by two semiquavers – acting as a pickup into the final bar. In the final bar Jamerson breaks from the established rhythmic and melodic feel and begins his approach back into the chorus. The rest of the band re-enter at this point, which might explain why he strips his playing right back. The first couple of crotchets are on the root and third, before playing a very typical Motown figure featuring an eighth note run using the fifth, sixth and root. This extract is a great example of how Jamerson uses open strings to add bounce to his playing. These open strings are often non-diatonic notes, but by using them quickly and moving to a stronger chord tone the tension is quickly resolved. This tension and release, coupled with the ascending / descending phrases and bags of groove make this bass break a new favourite of mine. Wonderful stuff, thank you. Understanding how the master worked his magic unlocks so many useful techniques. Apart from that it's just fascinating. Thanks again for sharing your passion.